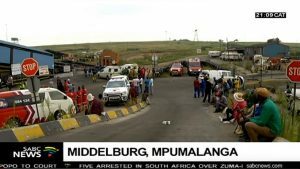 The 13 bodies that were retrieved at the Gloria Coal Mine in Middelburg, Mpumalanga on Friday have been identified. Families of the deceased gathered at the Middelburg hospital mortuary on Saturday morning for the identification process. All the deceased are Lesotho nationals who went underground to allegedly steal copper cables from the Gupta-owned mine which was closed after being placed under business rescue in 2018. Lebogang Solegane lost his uncle in the mine tragedy. The families of the deceased have pleaded with the government of Lesotho to assist with the process of repatriating the bodies. Post-mortem results are expected to be released in two weeks’ time. Five bodies were recovered two weeks ago. More bodies are yet to be recovered. More than 20 people were trapped underground earlier this month after a gas explosion. The post Thirteen bodies identified at Gloria Coal Mine appeared first on SABC News – Breaking news, special reports, world, business, sport coverage of all South African current events. Africa's news leader..